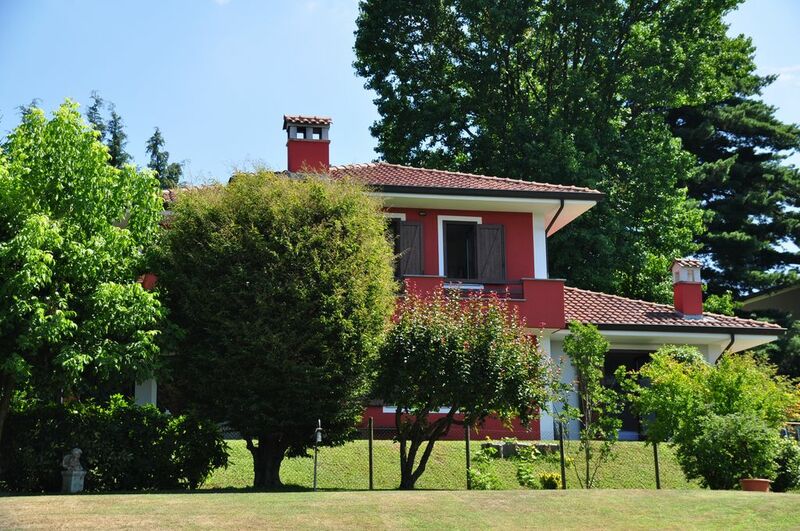 Wide Villa, devided in 2 floors, comfortable for 8 people, 5 minutes drive from the Orta lake, 20 minutes from the Maggiore lake, at the slopes of Mottarone mountain, ideal for a relaxing holiday in the quietness of the hill, of the lake and of the mountain. During winter time the house renting fee are inclusive of the heating system cost. the Villa sized 150sq meters has wifi, satellite television, bbq, exclusive access and usage of the 2 floors of the house, patio with big table good for a dinner of 8 people, terrace, exclusive usage of the big fenced garden. - ground floor - spacious open space with kitchen area, sitting room , and dining area, kingsize bedroom and bathroom with shower. I have been spending freetime in Armeno since I was a child, it is the perfect location to forget the stress of the city, stay in the fresh and forget all about your busy life. I love stay in the garden or go hiking nearby in the hills, or the best , is swimming in the clear water of the Orta Lake. in the evening i love to dine in my garden, or in the restaurants facing the Orta Isle. Armeno and our villa are the perfect place for a relaxing holiday, in the quiet and peaceful atmosphere of the hill, but not far from interesting touristic places, 30 minutes walk from Orta lake, 20 minutes drive to Lake Maggiore, out of the caos but close to top rated touristic locations such as Stresa and Angera. you can enjoy swimming in the lakes, hiking or biking in the fresh of the woods, trecking in the near mountains in Val formazza, Val Devero, Valgrande, as well as on the Monterosa, the second Highest mountain in Europe. In winter you can sky on Mottarone or in others famous locations not far from. 75 minutes drive from Milano is a perfect starting point for visiting this wonderful town. you will have the exclusive use of the villa, of the garden, of the portico and of the terrace with wonderful view, you can relax on the hammok, or you can sit at the fresh shadow in the armchairs set on the back of the garden, or enjoy the sunshine on the sleeping beds , grill your dinner on the barbeque and have your dinner on the big table under the portico. Wir haben 10 wundervolle Tage dort verbracht. Das Haus ist sehr gut ausgestattet, alles was man braucht ist vorhanden. Angenehme Schlafzimmer, toller Garten, spezielle mit Kinderen sehr schön. Wir können das Ferienhaus nur weiterempfehlen. Die Vermieter sind sehr freundlich und stets hilfsbereit, es war ein sehr angenehmer und unkomplizierter Kontakt. Werden sicherlich wieder mal dort Ferien machen. Dear Lukas, Thank you so much for nice words, well appreciate, you are welcome again in the future! A perfect family home when you want to have peace & scerenity. Highly recommended. Luca is the perfect host. When he said “everything you need is there” he really meant it. We just moved in as a family as if we were at home. Luca is very responsive and ready to fix any problem. His home is beautiful & spacious - a detached house with land on all four sides. Secure for the kids with plenty of outside space to play. Perfect and stunning views. Quaint local town close to Lake Orta. If you want to get out of the city and have a peaceful stay in a beautiful location - this is it. 4 bedrooms, 2 lovely bathrooms, open plan kitchen-diner & living space, with panoramic view of the mountains. Would highly recommend to families. Thanks Luca. Hope to stay with you again. It was a pleasure to host you in our villa, hope to have you and your family again in the future as our guest . Thanks for your nice review we do all what we can to have our guests feel comfortable and really at home, we hope to host you again in the future , with great pleasure. We could not fault Luca in responding to any queries we had both prior to and during our vacation. Upon arrival at his beautiful detached villa, we were greeted with a 'welcome pack' of typical Italian goodies & essentials which was a lovely surprise. The villa is comfortable, clean & equipped with most modern cons which were appreciated but in times of hot, humid weather, a stand fan in the bedrooms would certainly have been welcomed. The villa is in walking distance to a couple of local bars, supermarket, pizza takeaway, pharmacy, bread shop etc. and not too far away are a couple of family-run restaurants and Agriturismo's. We can highly recommend the nearby 'Vinaggia' Agriturismo for wholesome & value-for-money traditional Italian fare! Car hire is most preferable to explore the spectacular surrounding area of both Lake Orta & Lake Maggiore. A drive up to Motterone is a must for the amazing views and the unique experience of the Alpyland mountain rollercoaster. We had a fabulous 2 weeks holiday and would certainly recommend this beautiful villa to both couples & families. Lovely villa, in delightful little town. Luca is very prompt at responses to your queries. He has a beautiful house set in a residential area of a traditional Italian small town, within walking distance to a local bar, supermarket, pizza shop, pharmacy etc in Armeno. It is suitable for two couples or two families with plenty of space inside and in the garden. All facilities are as described, you want for nothing for an extremely comfortable holiday. It is well equipped, clean and spacious. When we arrived it was hot and very humid and the only thing that would change the villa from "wonderful" to "perfect" would be the addition of stand fans for the bedrooms. Carhire is essential, and is a must in order to see all that the surrounding area has to offer. Thrill rides at Alpyland up Motterone mountain, market day at Omegna, lazy days swimming in the lake or discovering hidden valleys and twisting roads to traditional villages. Find little lake Mergozzo with its quaint cobbled streets and large lake Maggiore with its stylish seafront of Stresa,all within a short drive. Drink and eat at a local agriturismo for a gastronomic delight. We Recommend Vinaggia on the road to Omegna. All in all we had a fantastic holiday and would like to thank Luca and his family for making this possible. thank you very much for the nice review!! Sorry for the humidity the day you arrived, we had an unusual hot weather in the last month, followed by sudden arrival of heavy thunderstorms , this kind of situation is quite unusual for Orta lake, normally it is a fresh place, comfortable for sleeping in the night compare with the city. We will certainly follow your suggestion and add stand fans in order to face the occasional hot days. wish to have you again as guest in the future! !